The Activio Fitness System is available in two main versions (there are also some special editions not covered here). The first version is optimized for touch screen use and is installed and configured by the Activio staff on our dedicated hardware with guaranteed functionality and superior hassle-free operation time. The other version is the "Desktop version" - made for a standard Windows desktop environment on a laptop or a stationary PC. The installation process is similar on both versions. NOTE! The HR receiver need to be plugged in before the system is launched! Make sure the drivers are properly installed too. The first time installation consist of three steps, after these steps the system is initializing and starting the HR Receiver. After the software is launched the first time the main installation screen is shown. Use other start number: Read this article. 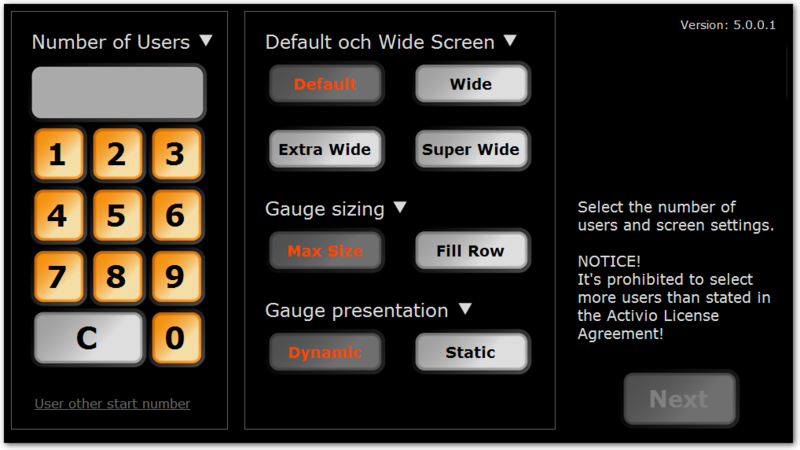 Default or Wide Screen: Select how the Activio gauges should be viewed, recommended is to use "Default" which fills the entire screen. The other ones fill 80%, 60% and 40% of the screen height. NOTE! This setting does not change the screen resolution, it only draws the gauges on a more narrow surface on the available screen. To change the screen resolution, it must be done in the Windows Settings. Gauge sizing: Select how the gauges should be drawn on the available screen width. Max size tries to maximize the gauges and could leave some black margins on the sides. Fill row fills the entire rows and leaves no black margin on the sides, however the gauges may be smaller and also draw a single gauge on the last row. Gauge presentation: Select Dynamic to draw the Activio gauges one-by-one after each user login and also drawn with maximum available size to fill the screen. Dynamic view is the recommended way to use the Activio Solution, especially if the Activio Smart Belt is used. Select Static to draw all the gauges (number of users) from the beginning and fixed regardless of how many users that is currently logged in. This is not recommended and the user experience is not as good as with the Dynamic view. Press NEXT to select the language for the main views.